Tough times require tough decisions. If Cuba’s healthcare system and biotechnology are to survive over the longer term, Cuba must face its demons and take steps to implement systemic changes to maintain it. The system is beginning to experience visible fissures that, if not addressed, may jeopardize its ability to honor the Cuban constitutional guarantee to provide cradle to grave healthcare for all its citizens. In the face of an historic economic and financial global meltdown, Cuba’s already depressed economy continues to worsen. Cuba is still recovering from three devastating hurricanes, a fall in the price of nickel, and the loss of sugar export revenue due to the worst harvest in over a century. In the face of rampant world unemployment, tourism and remittances have fallen dramatically as well, forcing Cuba to freeze or delay payments to foreign creditors. The impact of these factors upon the Cuban economy are being felt, noticeably: there are more electrical blackouts and fewer foreign products are available. The changes Cuba makes in the short-term and over the longer-term will not only impact Cubans’ everyday lives but also the sustainability and progress of Cuban healthcare and biotechnological development. Certain scenarios likely mean different outcomes for the health care system and biotechnology industry. It is assumed that within the next few years, the U.S. embargo will be lifted, if not entirely, at least partially. In Cuba, plans are underway for the gradual phasing out of daily lunch program for workers, while not raising salaries to compensate workers to buy their own lunches. At the same time, Cuba has also recently announced significant layoffs of workers in some sectors who may not be able to find other employment or who will not be able to start their own businesses to eke out a livable wage. The combination of these factors is leading to more and open displays of internal strife (Weissert 2010). The concomitant medical effects of these proposed cut-backs and rising unemployment could very well repeat those experienced during the Periodo Especial, when the former Soviet Union ceased being Cuba’s primary financial partner and subsequently withdrew its economic support to Cuba. The outbreak at that time of optic neuropathy, which can lead to blindness and is caused in part by nutritional deficiencies, is well documented in peer-reviewed journals. If this were to occur, an already burdened healthcare system will be even more burdened. While Cuba has resumed some payments to its creditors and has unfrozen some bank accounts of foreign businesses, nevertheless, this does not seem sufficient incentive for foreign businesses to do business with Cuba. Cuba’s reliance upon subsidies from Venezuela is precarious, as it is subject to how the political winds blow at any given time. To pull itself out of its economic morass, Cuba needs to motivate its younger citizens to work and be more productive. This is critical if Cuba expects its younger workers to remain in Cuba and not defect. But it is very hard to motivate younger citizens that have grown up in a paternalistic State. At the other end of the spectrum, Cuba plans to extend the retirement age to reduce its retirement benefits liability. Referred to above, the Cuban government recently announced that, in an effort to relieve its already severely burdened economy, it will lay off more than a half-million state workers and create hundreds of thousands of private-sector jobs. These layoffs will begin immediately and continue through March 2011. More than 85% of Cuba’s 5.5 million workers are employed by the State. However, Cuba will also have difficulty in creating private sector jobs since those jobs barely exist now. 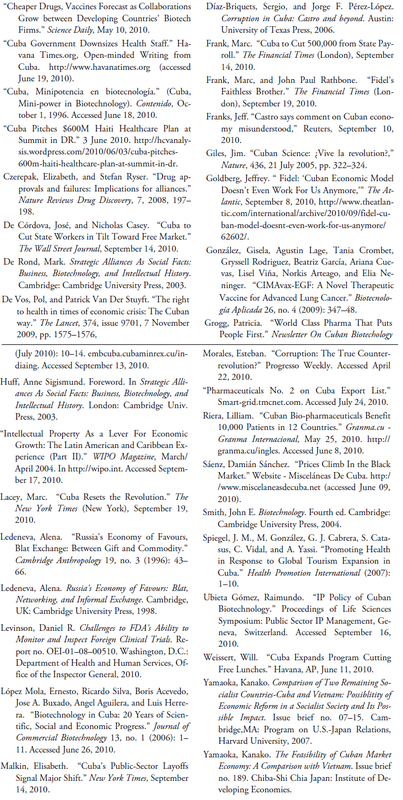 Nevertheless, it is also being reported that more jobs will be created in certain industries, among them the biotechnology sector, an area where Cuba is investing heavily (De Córdova and Casey 2010; Malkin 2010; Frank 2010). “Biotechnology will undoubtedly be the major technology of the twenty-first century. It concerns the practical application of biological organisms or their various components to the benefit of humankind, and spans a multitude of modern and traditional industries” (Smith 2004, Preface). This was not lost on El Jefe, Fidel Castro who, with prescience, proclaimed shortly after the Triumph of the Revolution that Cuba would become a nation of men of science. If Cuba’s biotechnology sector is not Cuba’s crown jewel, certainly it is one of its crown jewels (“Cuba, Minipotencia” 1996, p. 94). Today, Cuba’s pharmaceutical exports—which generated $750 Million [USD] revenue from medicines and vaccines in 2007—exceed those of sugar, tobacco and rum (“Pharmaceuticals No. 2”). As evidence of the significance of the biotechnological sector globally and the strides made by Cuba in creating innovative drugs and vaccines, Cuba is now a location of choice, with major global pharmaceutical companies opening offices in Cuba. Some biotechnology research centers in Cuba are opening new production plants as well. One example is the facility producing Nimotuzumab at the Centro de Inmunología Molecular (CIM), where it was originally developed. This drug is designed for treating pontine gliomas (like those which resulted in the death of the late Senator Ted Kennedy). Nimotuzumab, the first Cuban-origin drug to have earned approval for importation into the United States, is currently in Phase II clinical trials in the United States at some of the most prestigious cancer centers. Worth repeating, in 1960, one year after taking the reins of power in Cuba, Fidel Castro proclaimed Cuba would become a nation of “men of science.” The rhetorical pronouncement was backed with political will and funding to help Cuba develop a strong medical care system and a successful biotechnology industry. This commitment has enabled Cuba to develop what is known as the Western Scientific Pole in Havana, where most of its scientific research centers are located. Cuba’s biotechnology sector continues to benefit from Cuba’s priority on education (including tuition free programs for those seeking M.D, PhD and biomedical engineer degrees) and a highly educated general work force. Necessity is the mother of invention. Cuba, early-on in the post-Revolution era, recognized self-reliance was key for survival. Some Cubanologists, political scientists and think tank analysts argue Cuba’s biotechnology sector is one of the unintended beneficiaries of the U.S. embargo. In a similar vein, Dr. Manuel Raíces Pérez-Castañeda, Ph.D., business development manager at the CIGB, has said: “The success is not sales, it’s the impact on society. We are chasing problems, not profits” (Giles 2005; López Mola et al. 2006). Cuba’s biotechnology is translational—from bench to commercialization. Its scientists are enterprising. Cuba’s biotechnology is closely linked with its health policy allowing for quick introduction of new drugs and vaccines into the consultorios and policlínicos. The focus is the health of the patient and bettering social outcomes rather than commercial benefit. When organizations lack cash, it forces them to rid themselves of ideas that are fluff and focus on those that possess genuine potential There is little margin for error. This is a major factor in why Cuba is producing innovative drugs and vaccines, some of which are considered the “only ones in their class” in the world. These drugs and vaccines include Heberprot-P, used for the treatment of ulcerated diabetic feet and which is proving successful in prevention of limb amputation; CIMAvax, a vaccine used for treatment of lung cancer that is already in use in the policlínicos; and the anti-meningococcal B vaccine, VA-Mengoc-BC, the only vaccine available in the world to treat disease caused by meningococcus B. Its use is an integral part of Cuba’s infant immunization program and thus has ceased to be a public health issue since 1991. Presently in the works is a vaccine against pneumococcus. Cuba’s biotechnology is funded both by the government and through intellectual capital transfer generated via joint ventures with, and projects undertaken for, foreign countries and companies. Cuba’s biotechnology sector continues to form alliances and joint ventures with a number of countries including India, South Africa, China, Brazil, Iran, Vietnam and Venezuela to conduct clinical trials and share in the potential rewards. The list continues to grow. Alliances are often an integral part of most major pharmaceutical companies’ strategic plans and Cuba’s biotechnology sector is on board. Anne Sigismund Huff, Director, Advanced Institute for Management (AIM), London Business School, states, “Alliances serve as important strategy in an internationalizing and globalizing world” (Huff 2003). When alliances are properly formed and managed they can add value to all parties of the alliance (“Cheaper Drugs, Vaccines Forecast” 2010). However alliances and joint ventures face many challenges to achieve smooth operations to achieve their intended goals (Czerepak and Ryser 2008). Sustainability is often subject to corporate internal issues and political winds facing Cuba’s joint venture and alliance partners. Some of Cuba’s alliances are troublesome to the West, however. For example its alliance with Iran may not only be off-putting to many companies and countries, it could also result in its inadvertently falling into a violation of United Nations’ sanctions, thereby putting itself at risk for sanctions. This may discourage key players from cooperating with it. Beyond the difficulties cited above, Cuba has several balls up in the air simultaneously with alliances in countries such as India, Iran, and Malaysia. If Cuba is to become a respected participant in global pharmaceutical markets, it must exercise caution in selecting partners with whom to form alliances as well as where and how it conducts clinical trials. While it is cheaper to use foreign clinical trial sites, this may hamper Cuba’s ability to bring to market its drugs into the marketplaces of developed countries. Cuba is aggressively courting pharmaceutical companies to enter the North American market to begin clinical trials and ultimately market its drugs. There is concern, however, that Cuba’s clinical trials in Third World countries pose quality and verification issues. Recently, the U.S. Department of Health and Human Services, Office of the Inspector General, issued a report titled Challenges to FDA’s Ability to Monitor and Inspect Foreign Clinical Trials (Levinson 2010). While the report was not focused on Cuba, it did raise concerns about the quality of drugs entering the United States with regard to clinical trials that have been conducted in foreign countries outside the purview of the FDA. It is hard to achieve conformity in trials across a large number of countries as a result of scientific and non-scientific factors such as cultural issues in human subject selection, informed consent and legal liability laws relative to clinical trials. Nimotuzumab is the first drug of Cuban origin to have received approval from both OFAC and the FDA for importation into the United States and to begin clinical trials. It is now in Phase II clinical trials at some of the most prestigious medical centers in the United States, including Johns Hopkins Medical Center, M.D. Anderson Cancer Center, Sloan Kettering, and several of the Children’s Hospitals throughout the United States. To export drugs beyond Nimotuzumab, Cuba would do well to carefully select its clinical trial sites and assure compliance with international clinical trial standards. It is no easy task for drugs of Cuban origin to be imported into the United States. Two layers of approval encompassing two separate federal agencies are required: the first layer of approval is by the Office of Foreign Assets Control (OFAC) that requires the applicant to prove importation of the drug is in the U.S. national interest. The second layer is approval from the Federal Drug Administration (FDA) for clinical trials to begin in the United States. How Cuba structures its deals is instructive. In the case of CIMAvax, a therapeutic vaccine for advanced lung cancer; Cuba exchanged its intellectual capital for cash to be used for product development and for generating experience in its joint efforts with other countries’ regulatory authorities. With regard to the licensing of the project for its joint venture development with other countries, one of the lead scientists responsible for the development of CIMAvax, Dr. Gisela González, said this “means that the foreign counterparts covered the expenses of regulatory actions and clinical trials in their territories. As a result of these negotiations, Cuba received payments for milestones. This modality for negotiation also allowed us to have a constant exchange with specialists here and abroad, thereby increasing our experience. Our positive result with this negotiation modality could be applied to other products in progress in our country” (González et al. 2009). Another aspect of the business plan is designing and implementing a regulatory strategy for vaccine registration. This will make it available to all advanced non-small-cell lung cancer patients for fast track registration in Cuba for use by patients without any other therapeutic alternative. This included design of a quality system, quality controls and specifications that all were documented and which led to regulatory approval in other countries such as in Peru. This defined drug registration can be used in additional countries the obvious benefits of these kinds of arrangements, through formation of alliances with other countries is to conduct clinical trials that are very expensive and labor intensive. (González, et al. 2009). The R&D focus of the patents include: autoimmunity, cardiovascular, healing, agriculture, meningitis, cancer, infectious diseases, therapeutic vaccines, vaccines and adjuvants, for example. Countries that have granted patents to Cuba include: India, South Africa, Korea, China, Malaysia, Thailand, Russia, Brazil, Argentina, Mexico, Europe, United States, Canada, Japan and Australia. (López Mola et al. 2006; Ubieta Gómez 2010). “With some 150 biotech patents in the country, and almost 70 in force abroad, and with exports of its products and technologies going to some 50 countries, Cuba has linked scientific skill with IP awareness in order to promote economic growth and further fuel is innovation cycle. Protecting its IP rights has also given Cuban biotech enterprises the possibility of forming joint ventures with foreign joint ventures with foreign partners-opening up new markets and increasing economic return” (“Intellectual Property” 2004). Given that Cuba holds patents in other countries including in developed nations and exports to more than 35 countries, it is not impossible for Cuba to someday realize such profit levels. Continuing joint-venture and alliance formation will further enhance these prospects. While the biotechnology sector has continued to grow in importance as a generator of revenue from its exports of drugs and vaccines, the Cuban healthcare system has not fared as well. Though highly praised by researchers and public health professionals, Cuba’s healthcare system is beginning to show many deep cracks. A developing nation, Cuba has little margin for error in managing its economy. The de-stabilized world economy as a result of the global financial crisis has further weakened Cuba’s already precarious financial condition. This has had a deleterious impact on Cuba’s healthcare system. Two years ago, the Cuban government began developing an investment plan to recover the material damage to a group of hospitals in Cuba. Saudi Arabia has extended a loan to Cuba for building and rehabilitating medical facilities The 25 year loan (for an unspecified amount) includes a five-year grace period; the work funded by these proceeds is anticipated to take three years. Planned downsizing of health staff is being implemented “to establish rational flexible staffs that respond to the real interests of the system for the good operation of its institutions,” according to Armando Guerra Vianova, National Labor Director of Economic Area of the Ministry of Health (“Cuba Government”). This downsizing is resulting in a shortage of medical personnel. Nevertheless, Cuba continues to send medical personnel to Third World countries as part of its medical diplomacy, which is an integral part of its foreign policy. An unintended consequence of sending medical personnel abroad is a significant brain drain, as medical personnel flee to countries like Ecuador that only require a letter of invitation and has no visa requirement. Once there, Cubans marry Ecuadorians and later emigrate to other countries, such as the United States. Medical diplomacy is extracting a very high price, both financially and reputation-wise for Cuba. Cuba’s policlínicos and hospitals continue to deteriorate as the nation is unable to repair, update or replace many of its seriously outmoded medical facilities and equipment. Nevertheless, Cuba maintains its commitment to its practice of medical diplomacy, sending medical personnel to Third World countries amid growing complaints from the host countries regarding the quality of medical personnel (including allegations that paramedical professionals are being sent, not doctors as was represented). Doctors also complain about working conditions in these countries, alleging slave-like work situations that have prompted many to defect. Several Cuban physicians who allege slave-like work conditions are plaintiffs in a lawsuit filed in Miami. While healthcare facilities in Cuba continue to deteriorate, Cuba nevertheless has committed to help rebuild health facilities in Haiti at the rate of $170 million a year during the first four years (“Cuba Pitches” 2010). Medical tourism is compounding Cuba’s healthcare system problems. It is a double-edged sword. It generates revenue, but also internal problems, such as increase in prostitution, HIV, and corruption (Spiegel et al. 2007). Cubanacán Turismo y Salud and Clínica Central Cira Garcia are used for tourists seeking knee replacements, liposuction, face lifts, and abortion seekers from other Latin American countries where abortion is illegal. These facilities are equipped with state-of-the-art equipment and fully stocked with medicines well beyond basic medicines available to typical Cubans. These facilities are restricted to use by patients with the ability to pay cash or whom their country of origin insures. Post embargo, given the rise in medical tourism, might United States citizens be sent to Cuba for insurance covered treatment? If so, the cash infused could wind up making it a “net win” for Cuba and Cuban patients as well as generating revenue. As cracks become deeper, a critical issue is whether Cuba will be able to maintain its healthcare system. Recently, the powerful Minister of Public Health, José Ramón Balaguer, M.D., 78, was replaced by Roberto Morales, M.D., 43, who reportedly has been given the charge to shift priorities back to domestic healthcare in an effort to curtail domestic budget bleeding. Another major challenge facing Cuba is its aging population, which will cause care to move from prevention to more expensive curative care, further burdening an already heavily burdened system. Cuba continues to experience critical shortages of basic medicines and equipment, in part due to the U.S. embargo that forces Cuba to purchase equipment from other countries where it is far more costly. Where the country of manufacturing the medical equipment is the United States, a broken part is often irreplaceable, rendering the equipment unusable. Cuban citizens who do not receive remittances. The informal market,1 while always operative in Cuba, is growing in importance as even basic medicine becomes increasingly scarce or sometimes unavailable, and access to healthcare becomes more strained with longer queues and fewer doctors to treat patients. As shortages grow and demand increases, prices are also rising in the black market. (Sáenz 2010). Is this the start of a second Periodo Special? If so, will this portend the end of Socialism in Cuba? There are those who argue that the informal market is serving to erode the very socialistic principles that Cuba seeks to uphold. Can Cuba sustain its healthcare system as shortages of drugs and medical equipment continue? The answer may lie in thinking about what Cuban healthcare might look like post-embargo. Essentially, Cuba may have a system that is a hybrid private/public mix. It is not out of consideration that a for-profit company, either created by Cubans or one that is an established foreign medical care player, could take over that segment of the healthcare system that serves medical tourists. It would also result in an improvement in medical diagnostic equipment but only for those facilities that serve insured and/or cash paying medical tourists. Operating along with the informal market is widespread corruption including and involving persons at a highest level within the Cuban power structure. Esteban Morales argues corruption is more harmful that outright revolution (Morales 2010). Fidel Castro issued this same warning many years ago. Others argue that corruption is a serious impediment to Cuba’s economic growth over the longer term (Díaz- Briquets and Pérez-López 2006). How might the future look for Cuban healthcare and biotechnology post-embargo? Cuba could become the next Vietnam, with a public/private mix. But for that to happen, Cuba may have to put in place changes to its Constitutional guarantees of free cradle- to-grave health care (De Vos and Van Der Stuyft 2009). Cuba may have to rethink a foreign policy that includes medical diplomacy that is taking its toll on its own citizens. An influx of tourists would tax an already economically strained healthcare system. Cuba may also witness a mass exit of medical professionals, which is already occurring. For-profit companies could take over all or part of its healthcare system for use by medical tourists. It remains to be seen if revenue realized from medical tourism business will be used to internally subsidize facilities used by Cubans that are in serious deterioration. If that were the case, Cuba may see an improvement in its sanitary conditions and in maternal mortality and post-partum sepsis that persists due to unsanitary conditions in hospitals. Is Cuba the next Vietnam with a market economy without democratization? (Yamaoka 2007). As President Raúl Castro continues to try to implement more market-based reforms, will a market economy lead to demand for political change and thus threaten the socialistic principles upon which the revolution in Cuba is predicated? (De Córdova and Casey 2010; Frank 2010; Malkin 2010). Cuba is on the cusp of change. Recently, it has been reported that Fidel Castro said to Jeffrey Goldberg, a national correspondent for The Atlantic Magazine, “The Cuban model doesn’t even work for us anymore” (Goldberg 2010). He later claimed to have been misquoted and offered the following clarification: “My idea, as the whole world knows, is that the capitalist system now doesn’t work either for the United States or the world, driving it from crisis to crisis, which are each time more serious. How could such a system work for a socialistic country like Cuba” (Franks 2010). Whatever spin capitalism is given, it remains that Cuba’s economy goes from crisis to crisis without ever realizing a recovery. For Cuba to realize any material recovery to its economy, it must use revenue received from its growing medical tourism business and real estate developments to subsidize the healthcare system used by its own citizens and make needed upgrades and replace outmoded facilities and medical equipment. It appears that Cuba is in the midst of change. The outcome of change and its effect on Cuba’s healthcare and biotech sectors remain unclear. If Cuba begins to engage and integrate into the larger economic world order and forges new economic relationships— potentially with American-based pharmaceutical powerhouses—significant money and resources could come into Cuba that will help upgrade the health care system and open new and greater opportunities for Cuban biotechnology. 1. Informal markets are those in which there are informal exchanges of favors (known as “blat” in the former Soviet Union), which allows Cubans to obtain needed medical services and medicines (Ledeneva, 1996).